to be able at any moment to sacrifice what we are for what we could become." As a university faculty member for some seventeen years, I dreaded departmental meetings. At every department meeting, each faculty member would file in, take his/her usual seat, suffer through the meeting, and leave, almost all feeling time would have been spent much better some other way. At each meeting, there was a time for the department chair to make his announcements, for committee chairs to make their announcements, and for some discussion and/or voting on issues. A few opinionated senior faculty members almost always dominated the discussions. Those with a vested interest in a decision also contributed. The opinions as well as the outcomes of the votes were almost always predictable. Facial expressions and body language during the meeting could usually be described in two words: pained boredom. Most faculty members left the meetings feeling no outcome would have been different had they not attended. Attending departmental meetings was not voluntary. The right to choose not to attend was a benefit I accrued only after I left the university. As I began working full-time in schools and with teachers, I discovered many school faculty meetings suffered from the same problems as did those dreaded meetings back at the university. When I later analyzed the problem with traditional faculty meetings, I concluded that they suffered the same malady as the traditional classroom. They both lacked interaction, active participation by its members, a sense of belonging and control. They both lead predictably to disengagement, frustration, and alienation. Schools were being successful alleviating the ills of the traditional classroom structure by implementing cooperative learning. I believed faculty meetings could be similarly improved. To analyze the effectiveness of cooperative learning lessons, we do a PIES analysis — we evaluate the lesson based on its inclusion of the basic principles of cooperative learning. Let's perform a PIES analysis on the traditional meeting to reveal its structural flaws. P stands for Positive Interdependence. Positive interdependence exists when one person's gains lead to gains for another (a positive correlation among outcomes) and when no one person can reach the goal without the help of others (interdependence). In the traditional school faculty meeting, issues have been defined before the meeting and faculty members have taken sides. At the meeting, there is a vote. Sometimes, preceding the vote advocates speak pro and con on the issue. Those who win, win at the expense of those who lose on the vote. The gain of one is the loss of another. This is a classical situation of negative interdependence (the gain of one is a loss for another) and the vote polarizes the group. Instead of leaving the meeting feeling all on the same side, the faculty members often leave the meeting feeling some have won and some have lost. I stands for Individual Accountability. Individual accountability exists when each person is required to make a public performance. Individual accountability is absent often in the traditional classroom; some students are "off the hook." That is, students know that by not raising their hands, the teacher will not call on them. They will not have to perform. Thus, motivation to be engaged and to learn is decreased. Only some students choose to raise their hands, to play the game. The teacher ends up calling on those who least need the practice, ignoring those who most need the practice. The same lack of individual accountability exists in the traditional faculty meeting. Some faculty members choose not to participate at all, allowing the outspoken members to do all the talking. Those who do not participate leave feeling that their presence at the meeting did not make a difference. E stands for Equal Participation. Although perfectly equal participation is never possible, in the traditional classroom there is almost perfect inequality. Some students are called on often and some are never or almost never called on. This inequality of participation exists also in the traditional faculty meeting, leading to alienation among those who do not participate. S stands for Simultaneous Interaction. The question we ask in regard to simultaneous interaction is "What percent of the participants are overtly active at any one time?" The reason this question is so important is that the answer tells us the amount of active engagement among participants. For example, if we have thirty faculty members in a one hour meeting and they speak one at a time, if the leader did no talking at all on the average each person could speak but two minutes! Of course the leader often does the most talking, so faculty members do not get their full two minutes! With less than two minutes of active participation per hour, boredom and a feeling of not making a difference are almost certain outcomes. What is the problem? It is the one-at-a-time sequential interaction pattern, each person waiting his/her turn. If we apply the Simultaneity Principle, most people are actively engaged at the same time. For example, if the faculty members interact in pairs, in the same hour, on the average each person has a half hour to make input! A half hour of active engagement versus two minutes of active engagement per hour is the difference between feeling one has had a significant contribution to a meeting versus feeling one might as well not been there. Active engagement is critical; it leads to the feeling one's ideas count, feeling part of the decision process. The alternative is alienation. Given that traditional meetings are characterized by negative interdependence, absence of individual accountability for participation, very unequal participation, and alienating one-at-a-time sequential participation, there is need to restructure faculty meetings. How can we best transform meetings into a time everyone enjoys, where there is mutual support, a feeling of community, a feeling of being respected, and a feeling one's input is valued and makes a difference? How can we restructure meetings so decisions do not result in winners and losers but rather a feeling of community consensus? I turned my attention to this problem after having spent years restructuring classrooms. Essentially the problems with traditional meeting formats are the same problems as those generated by traditional classroom structures. Having successfully restructured classrooms by applying PIES, it was a relatively small step to propose using the same approach to restructuring faculty meetings. Thus about 15 years ago I began giving workshops to administrators on how to use cooperative structures to restructure their faculty meetings. A group of administrators from the Durham School Board in Toronto Canada took the training to heart and radically transformed their meetings. The result went far beyond changing meetings and surpassed by far our highest expectations. When faculty know and support one another, celebrate their diversity, regularly assist each other in professional development, and make decisions using collaborative decision making structures, everything changes! A community of leaders and learners emerges in which every faculty member feels empowered to make a positive difference, each member identifies with the school mission, and each feels part of a larger whole. Adopt cooperative faculty meetings and you change the whole culture of the school! After over a decade of testing and perfecting the use of structures for faculty meetings, three leaders from the Durham Board and I set out to create a step-by-step resource that any principal or meeting leader can use to navigate the voyage from traditional to cooperative meetings. We are proud to finally make this work of labor and love available: It is called (not surprisingly) Cooperative Meetings. 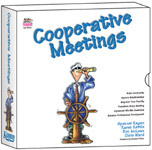 Cooperative Meetings is a rich resource for anyone wishing to transform a faculty into a community of leaders and learners. The boxed binder has fourteen chapters. At heart, though, it is very simple. It is dedicated to the proposition that meetings are far too valuable a time to waste on announcements, reports, and polarizing votes. All meetings should be devoted to three functions: Building Relationships, Professional Development, and Collaborative Decision Making. To support that vision the book provides tons of structures, ready-made blackline masters for activities, logs, scenarios, hints, philosophy, relationship builders, games, initiative tasks, and decision making structures. In short it is the most comprehensive resource ever created for leading cooperative meetings and becoming a cooperative school. In his foreword to the book, Michael Fullan, the world's leading expert on school change, states, "No other resource book exists that contains such a comprehensive set of strategies to enhance learning for all... All leaders interested in promoting and facilitating learning organizations will find this book invaluable..."
Team Statements are one of the over 50 structures provided in Cooperative Meetings. Each structure includes steps, variations, hints, PIES analysis, idea starters, and blacklines and/or recording sheets. Once you have made decisions using Sum-the-Ranks rather than voting, you will never want to vote again! Cohesion replaces polarization. What happens when a collaborative decision making structure replaces a winner-loser decision making structure is a microcosm of what happens on a grand scale when cooperative meetings replace traditional meetings. Cohesion, mutual support, and productivity replace division, dissension, and stagnation. Once you and your faculty members set sail on the voyage toward cooperative meetings, you will never want to lead or be part of a traditional meeting. Good luck as you embark on this voyage. The destination: A community of leaders and learners mutually supporting each other toward a common goal. We have worked for years to perfect Cooperative Meetings — a compass and a map to help you chart your course. Cooperative Meetings makes it fun and easy. It is up to you, together with your faculty, to use Cooperative Meetings to chart your course, pull up your anchor, set your sails, and head out from port. Meetings are one of the few times that the faculty is together. When structured well, they become the royal road to creating a community of leaders and learners. This groundbreaking resource offers both a vision and map: It charts the course to building positive staff relationships, ongoing professional development among faculty, and empowering your faculty to make wise decisions. • Section 1: Building Relationships shows you how to improve staff relationships, build powerful staff teams, create community, and develop collaborative skills. • Section 2: Developing as Professionals shows you how to use a range of structures as an integral part of meetings to foster staff development and model improved classroom teaching. • Section 3: Making Decisions provides specific, step-by-step structures and procedures to make informed, collaborative decisions. • Section 4: Leading Meetings is your insider's guide for creating a true community of leaders and learners.